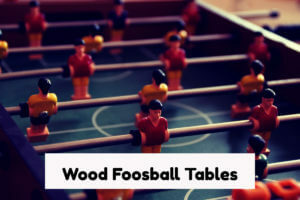 For persons who have discovered the joy of playing foosball and are desirous of owning wood foosball tables, buying one has to come from a position of being informed. 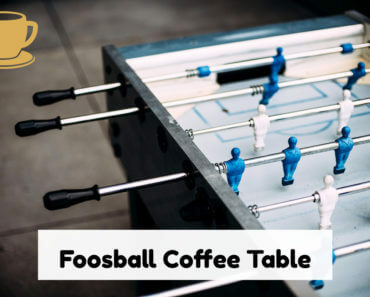 There are many types of foosball tables being manufactured and we are going to educate you on the many benefits of owning a wood foosball tables, which is just one such type. A good, solid piece of furniture to invest in is always a smart decision. Having said that; owning an EastPoint Sport Durango Foosball Table is one of the best there is. This wood foosball tables is unique in the coloring, which easily blends with your furniture. Placed in a game room it will certainly enhance your space. 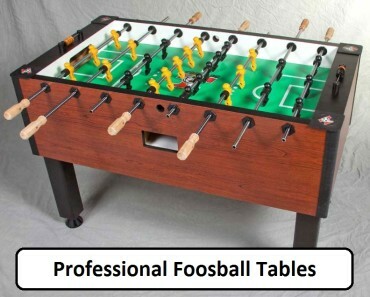 It is one of the foosball tables many professional players do use. It is an Official Competition size table with solid parts that are made to withstand rough and energetic play and great fun when entertaining friends and family. The Sport Squad Georgetown Foosball Table is an excellent buy. At $1,199.84 you are treating you to a great experience as well as a worthwhile investment. For American Heritage Billiard’s Element 58” Foosball Table is an investment in quality furnishing. Their concept and vision began in 1987, and the business has grown into an International name in game room furniture products. The Element 58” Foosball Table is built to last. It is made from engineered wood and finished with a maple brown veneer. The cabinet is trimmed with metal trimmings and it is also complemented with metal cross beam legs. The legs are structured with adjustable leg levelers which enable leveling the table to any surface. The American Heritage Billiard’s Element 58” Table is sized at a hefty 189 pounds and its dimensions are L 32” W 57.75” H 34.25”. Playing men are made in colors of black and silver and of a glossy finish, and the scoring unit is manual and affixed to both ends. Purchasing this Foosball table will add class and elegance to any game room and will certainly enable both friends and family may hours of enjoyment. The Garlando G-500 Indoor and Outdoor Foosball Table is recommended for family play whether indoor or outdoor. The weight is easy to move and so it is not too much of a problem to use in either area. Owners have indicated they really enjoy this foosball table, as there are able to entertain friends and family alike; while it is easily played by their 10-year-old children and their friends. The basic consensus is the table is quite good and a great buy. 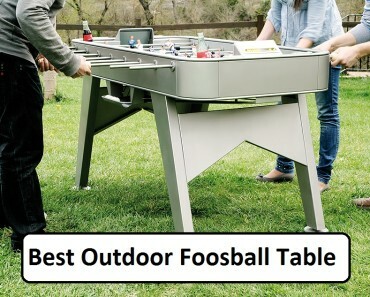 The average rating for the Garlando G-500 Indoor and Outdoor Foosball Table is a 4-Star; not a bad combination at all. You don’t need a rocket scientist to introduce this table to you. Looking at it speaks volumes. This Portuguese Foosball Table is made from SOLID WOOD! It is handcrafted and made as the company started making them since 1977. Because it is handmade, the charms of this table are its imperfections in coloring as well as the playing men; they are also handmade and hand-painted to depict the various positions on the field. Sturdy and built to handle any and all rough plays; it is built to last a long time. One satisfied customer indicated; “This is the real Deal!” who also gave the table a 5-Star rating. Easy assembly with two persons; 10 minutes tops! Investing in wood foosball tables are certainly a wise choice. Their durability and charm, not to mention the many hours of professional as well as amateur plays you will enjoy far outweigh the cost. Foosball tables made with other materials are workable, but you may not have the experience you want as with a wood foosball table. Challenge yourself as a foosball enthusiast and see the many benefits.